…Beyond being a huge rivalry game, the Little Southwest Conference title may be on the line. Cooper looks big; their offensive line must have 50 pounds per man on the Eagle defensive front. Speed is going be the key, as Fullen had said hours earlier. Both student sections are completely full of kids who stand the entire game. The black-clad Eagles, with gold helmets, and the Cougars, in white and blue with red trim, head to the locker room. He’s right, the atmosphere is electric. …The 2012 Crosstown showdown is the type of game that will be remembered forever by those who were there. …The game between Abilene High and Cooper on this night in 2012 joins my list, and probably the lists of most lucky enough to be in Shotwell. The Cooper Cougars jump ahead, taking a 7-0 lead after an 11-play drive when quarterback Lorenzo Joe scores on a 17-yard run. The Eagle offense struggles, Abilene moves the ball well, but fumbles away two first quarter drives. The Cougars are stopped deep in their own territory on their third possession. At this point the Cougars make one of their few mistakes of the night, a bad snap on a punt attempt recovered by the Eagles in the end zone, tying the score at 7-7. Early in the second quarter the Eagles take a 14-7 lead on a four yard pass from Evin Abbe to Keevan Lewis. Just before the half, however, Cooper scores on a 28-yard pass to Anthony Pierson to climb within a point, 14-13. The PAT is blocked and Abilene High leads by one going at the half. Cooper is good; Lorenzo Joe is throwing well and always a threat on the ground. The Cooper defense is flying around as hard as the Eagles. Anything could happen in the second half, but this game just feels like it’s going down to the wire. 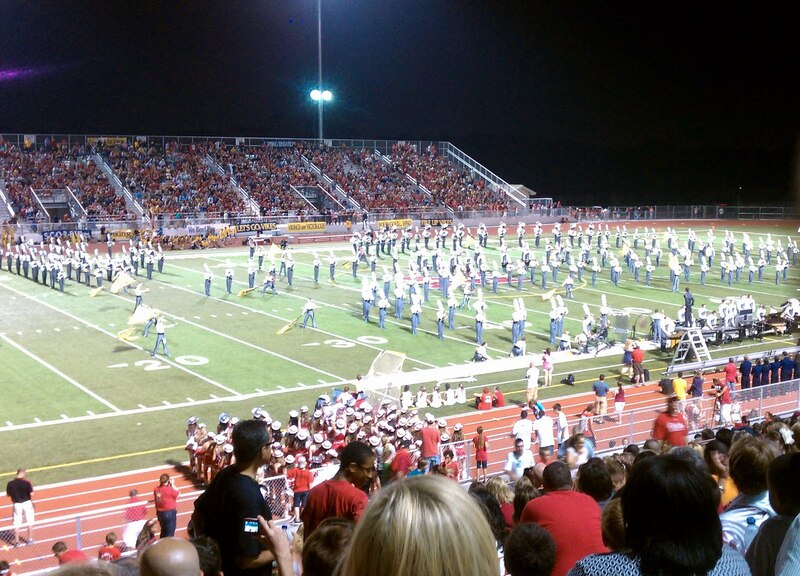 Both Abilene High and Cooper have big bands and long routines. The 28 minute halftime isn’t enough and players and coaches wait on the sideline as the Cooper band finishes. Warren strolls over to talk. “This game is always like this,” he says, as though talking about something unconnected to him. I don’t know what’s going through his head, but I’m more nervous than he looks. His cool in the face of what must be tremendous pressure is impressive. The Eagles score on the opening drive of the second half, getting into the end zone on a three yard run by Marcell Porter to extend their lead to 21-13. Any hope that the Eagles may pull away after the intermission is quickly dispelled as the Cougars put together a drive of their own, converting twice on third down, once when a Cougar receiver makes an acrobatic catch along the far sideline, dragging his toe inside the boundary to keep the drive alive. Cooper scores on a 17 yard slant over the middle to KaShawn Brown. 21-20 Eagles with 3:38 in the third. Between the third and fourth quarters the game stops, helmets are removed and everyone stands to sing ‘God Bless America’. I’m told that this ritual began this year for all games at Shotwell. Early in the final period, neither team get anything going. Abilene drives, but stalls at the 10 and the Eagles kick a 22 yard field goal to make it 24-20 with 5:13 left. My gut tells me that the failure to score a touchdown may come back to haunt the Eagles. The Cougars won’t go away, and with just a four-point lead, Cooper has plenty of time to score a go-ahead touchdown. Sure enough, the Cougars once again rise to the challenge, driving 10 plays and taking their first lead since the first quarter on a two yard run by Xavier McCann to make the score 27-24 with just 2:18 left. For the final two minutes, nobody sits. One big play or small mistake will determine the outcome; with so little time left whatever happens will be decisive and irreversible. The game will be decided by this battle between the Eagle offense and Cougar defense. One trait of a successful team is confidence that they’ll find a way to win. Even when things look bleak, when all the evidence shows they should be beaten, deep down a team like Abilene High expects to find a way to come out on top. Success breeds success, luck favors those with faith. Quality teams have a knack for winning games they should probably lose. Cooper has outplayed the Eagles tonight, and the momentum is on the far sideline, but Abilene High’s been here before. Bobby Johnson told me that back in the bad old days, Abilene High teams were often beaten before they took the field. Warren and this team are never beaten as long as there’s a second on the clock. Starting on their own 28 yard line, the Eagles move the ball to the Cooper 20, where they use their last timeout facing a third and 2 with 33 seconds remaining. A pass to the sidelines moves the chains and gives the Eagles the ball on the Cougar 10. A three yard run by Marcell Porter puts the ball on the seven but the clock is running and Abbe spikes the ball to the ground stopping the clock with 11 seconds remaining. Everyone playing has spent years working for this moment, everything hinges on this one play. Just one more stop and Cooper will have a clear path to a district championship. The noise from the packed stands is loud as 15,000 Abilenians roar and stomp their feet, aware of the importance of this snap. …One of the biggest obstacles Aledo will face in 2012 is their district schedule. Not because the schedule is challenging, but too soft. In previous years, Aledo had been in a district with schools to the west, a very competitive group including rival and perennial power Stephenville. After redistricting, however, Aledo was put in a new district made primarily of Fort Worth ISD schools. If there’s a weakness in the Texas public school athletic system, it’s the deterioration of big city school districts. Dallas, Fort Worth, Austin and Houston are the four largest districts in the state. Their athletic programs have the minimum all schools in the state have, full-time professional coaches with athletic periods. These minimums would be excellent anywhere else, but not in Texas. What these districts don’t have is much support. …Great teams occasionally spring from places with lack of support, but over the long term, good programs can’t survive where people don’t care about them. I’m sure a lot of good people work in the big ISDs, but fight uphill battles. …Practice at Aledo starts at 7:20. With athletic period scheduled during first period, this gives the Bearcats almost two hours before they hit the showers and get ready for class. They started early practices a few years ago when they moved to the new artificial turf stadium, and no longer had to worry about morning dew ruining footballs. Mornings have several advantages. The Bearcats avoid early season heat. Even on the hottest days, it’s pleasant at this hour. This schedule also allows flexibility afterschool; lifting, watching game and practice film, working on special teams and polishing rough spots are all done. After school is also when the sub-varsity practices. Football practices often take the personality of the head coach. Buchanan is professional and relaxed and this is the vibe of mornings at Bearcat Stadium. Position groups stretch in little circles around their coaches while the coaches discuss details of the game plan or any other needs. Buchanan strolls from group to group, an insulated coffee cup in hand, checking attendance. Aledo is one of two programs I cover who practice to music. During stretching the songs are soft and mellow, the type of music you’d like to wake up to. With the sun rising over the far end zone, the feeling is relaxed and loose as a buzzer marks the start of the first timed segment at 7:35. The morning is meticulously scheduled. On offensive, nine minutes are assigned for individuals, a two minute water break, outside hull for nine minutes, two minute water, then inside team for nine, another 12 minute team session, eight minutes of red zone and 10 minutes of crossover, letting the few defensive players who contribute on offense work on their skills. To mark the time, the scoreboard has been programmed to countdown each segment. Aledo has very good numbers. Between 180 and 240 kids from freshmen through varsity play football in this school of 1,344 students. This morning about 120 are here. Varsity players wear white jerseys and have orange Aledo “A”s on their helmets and four small Texas outlines denoting Bearcats state championships, the JV kids are in black and have no helmet decals. During inside run, the varsity runs two separate offensive units vs. two JV defensive scout teams. Across midfield, at the same time, the starting defense works against two JV offensive groups. One offense runs a play while the other huddles and reads the next play from a binder held by one of the coaches. The huge number of JV players gives the varsity many reps in a short time. …During the 1960s Stamford reached a peak of over 5,000 residents. At that time, the city was a rail hub and agricultural center. When the railroad left some population went with it. Over the years farming has gotten less labor intensive and the population declined further. West Texas is full of small towns like Stamford. Texas is growing fast, but the small towns in the West are shrinking. During the first decade of the 21st century, Texas added 1,000 new residents a day but West Texas slowly emptied as children of ranchers and farmers joined new Texans moving to the booming cities of the I-35 corridor. During the school week, the day starts early for Hutchinson and his staff. Stamford Junior High is just across the practice field and the seventh and eighth grade players come over for first period athletics with the high school coaches. The high school athletic period takes place just before lunch. McLemore quickly goes over the 11 page scouting report covering the main points the defense needs to focus on; the same points were on the white board on Sunday. Stamford runs a 3-3-5 defense. McLemore believes the 3-3 stack is better for stopping the run than the more common 3-4 and 4-3, with three protected linebackers keying the run. Against passing teams one linebacker may drop, giving the Bulldogs more of a two-safety look. Stamford runs the zone-read spread. They implemented this scheme four years ago after years running the option. Looking at the kids in the pipeline, Hutchinson saw a lot of good skill (backs and receivers) kids and thought the spread would be a good fit. With a dual-threat quarterback like Hagen Hutchinson, who is dangerous both running and throwing the ball, this offense is very tough to stop. The question was how to implement a completely new offense after years of running something entirely different. Until recent years Texas had been much more comfortable with smash-mouth running offenses. “Ten years ago, if you put two receivers on the same side, someone was liable to call you a communist.” Hutchinson says, only half joking. Now, most of the state has adopted the spread. The change really took hold with the hiring of Mike Leach up in Lubbock, at Texas Tech in 2000. When Leach took over, he brought new twists to an old formation. The base package is 10 personnel (one back, no tight end and four split receivers.) The formation has been around many years. It’s the same look run-and-shoot teams used in the ‘80s. What’s different is how this formation is used. Where previously the spread formation relied on a quarterback throwing from the pocket, and a limited running game, Leach’s philosophy was much more dynamic…. …Whitaker was up to the task. The program turned the corner in 2006. The clinching win over Beeville at Sandcrab Stadium delivering the first district title since 1961 was truly a watershed moment for this community. Something fundamental changed in Port Lavaca. Since 2005, the Sandcrabs have been to the playoffs seven straight years, winning five district titles, and the number of kids playing football has doubled. Before 2006, the seats at the Stadium were often empty, and fans didn’t follow the Sandcrabs on the road. Since 2006, locals began arriving hours before games, just to get a seat. Now people get off work early to make the trip to away games. On the road, Port Lavaca fans often outnumber those of the home team. The change hasn’t been limited to football. That first taste of success affected the town in many ways. As the rising tide lifts all boats, Calhoun’s other programs have become successful as well. The five years before Whitaker arrived, volleyball was the only sport to make the playoffs. Since 2005, boys basketball has been in the playoffs seven straight years, the girls made their first playoff trip in 12 years. Softball has five playoffs appearances, baseball has three. The boys’ track team has won three district titles and the girls finished second in district twice. Golf, cross county and powerlifting have also shown big gains. …Moore says the atmosphere for these big games brings the town together like nothing else. That kids can be successful without having tremendous talent is what drew me to high school football. As an undersized lineman during my high school years, I earned respect with work ethic and tenacity, something I couldn’t have done with athletic ability. To me, what makes high school football the greatest game in the world is how it rewards effort. The turnaround at Port Lavaca exemplifies this. Excerpt from To-Be-Named-Later GERMAN Football Book to be released in 20?? I want my Euro-football friends to know I haven’t forgotten about you. I have been writing a little everyday about my wonderful time in Baden – Württemberg . So far I’ve written just over 7,000 words, but am picking up the pace as I’m getting back into my writing rhythm. I’ve been back in the US a month today, but still miss Germany everyday. Here is an excerpt from the introduction. I hope you like it. …I’m aware that I’m over my head today, but also of the teams’ expectation of me. This isn’t the time to show doubt in my ability to do this job. We’re beginning the team offensive session; I call plays and correct mistakes as though I’ve been here for years. I’ll check to see what they understand later. Two days ago I was home in Reno, Nevada. I’d quit teaching three years earlier after becoming frustrated with the red-tape and narrow objectives that have infected American public education. Having no real plans, my mid-life crisis found me fulfilling various bucket-list items. Since my retirement I’d written a book, umpired high school baseball, substitute taught and spent winters as a ski instructor, but I always return to the one indispensible part of my professional life, coaching football. Looking for a writing project, I stumbled onto the world of football in Europe. I was fascinated with the idea of such an American institution in a foreign setting. Is there anything more uniquely American than football? I’m not sure. Baseball, while an American invention has been adopted in Latin America and Asia. Basketball has gone worldwide as well. Outside of sports, much American uniqueness has been co-opted by the rest of the world. Hollywood movies and pop music are the standard wherever there is electricity. McDonald’s and KFC’s provide a safe dining option for Americans wherever we travel. But football with its specific position requirements, its inherent violence, expensive price-tag, ingrained technology, discipline, teamwork and militarism seems quintessentially, 21st century American. Add big-money celebrity and corruption seen at its highest levels and football represents both the best and worst of America. Love or hate it, football is as American as Chevy or apple pie. The world is getting smaller though, like Hollywood, McDonald’s and rock-and-roll, football is becoming international. The US military built bases, and brought the game to Europe and Japan after World War II. 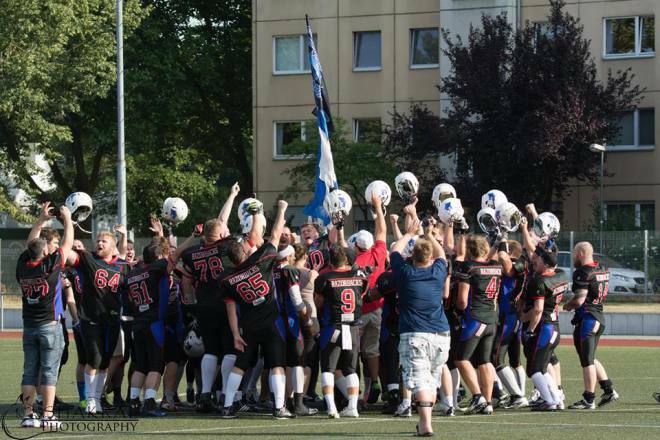 The NFL Europe may have been a failure from a financial standpoint, but it introduced the sport to a generation of Europeans. More recently, the internet’s made the game more accessible than ever. How is football being affected by contact with the outside world? McDonald’s may be everywhere, but its menus reflect local cultures, for example, serving mayonnaise with French fries in Germany. From discussions with Americans who’ve been involved with the game overseas, I already knew football had been adapted to fit the European culture and lifestyle. Here, nobody could imagine every day, mandatory practices… practices American coaches and players couldn’t imagine doing without. …Carthage lost a heartbreaker to Jacksonville last night. After the game, as usual, the coaches went to work breaking down the film, finishing up around 4:30 in the morning. Now, at 9:00 Saturday morning, defensive coordinator Darrin Preston and a few linebackers are in the fieldhouse watching the film. Preston is unhappy and looks disgusted as he repeatedly runs key plays on the screen. The linebackers and safeties are especially bad. The starting safety has a hairline fracture and will be out three weeks, the backup isn’t working out. The young replacement looks completely lost, dropping deep when he should come up and coming up when he needs to stay behind streaking receivers. The linebackers look tentative, going around blockers instead of taking them on and getting fooled by play action. The DC looks pained, watching such poor execution, knowing the blown assignments were a factor in turning a very winnable game into a loss. Preston has been around long enough to know that the first game is usually full of glaring mistakes. Coaches often don’t really know their team until they see them in a game, so it’s often trial and error in finding the right eleven to put on the field. Knowing this doesn’t make watching the Bulldogs blow the game any easier. The staff worked so hard to put the Bulldogs in position to win and somehow they couldn’t find a way to finish, giving the game away again and again. The backbreaker came during the final minute. With a three-point lead, a sophomore Carthage DB intercepted a pass along the sideline that should have ended the game. Instead of going down or out of bounds, the young Bulldog ran the ball back, cut across the field and was stripped. Jacksonville recovered and a few plays later, scored the winning touchdown. The coaches can’t help but question themselves. With all the hours they put in and all the situations they prepared the team for, they’d never coached the defense about what to do when picking off a pass during the final minute with a lead. Yes, the cornerback should have understood the situation, but the coaches know better than to expect a sophomore playing his first varsity game to be football savvy. Carthage just gave this game away and it shows on Preston’s face and in his body language. He sits hunched over and speaks slowly and sadly as though more than a zero-week non-district game was lost. After about an hour of watching film, the DC slowly tells the kids, with long pauses between phrases, “We gotta play aggressive…play assignments… and make plays…we’re looking for the best eleven… we were up here half the night…juggling names…if you can’t get it done in practice…” He leaves the last phrase hanging. Everyone knows changes will be made Monday. Carthage is a clean little town of around 6,000, a traditional town square and a strip with restaurants, convenience stores and other shops, surrounded by residential neighborhoods full of mostly well-kept homes peeking through the trees; nice, but not ostentatious. If there’s anything remarkable about the city, it’s the school itself. Only 741 students are enrolled but it has the feel of a much bigger place. The gym is large, really three separate gyms, divided by folded up bleachers. The cafeteria, library and classrooms are all spacious, airy and modern. Natural gas money has made this one of the richest ISDs in the state and bond issues have built this school into a showcase. Bulldog Stadium isn’t especially big by Texas standards, with 6,500 seats, but it’s comfortable with seatbacks in the middle section for season ticket holders. Unlike many newer stadiums, it has a one level pressbox. “It was too crowded as soon as it opened,” The radio play-by-play man tells me. A new replay scoreboard has just gone up in the north end zone. The scoreboard is a point of pride for the people of Carthage but seen in a different light by those who don’t understand Texas football culture. At 1,200 square feet, it is the largest high school scoreboard in the country. During a national recession, the scoreboard is an easy target for out-of-staters. The Wall Street Journal, Sports Illustrated and AP all ran stories on it. The Wall Street Journal didn’t say it directly, but implied this was another example of misplaced priorities in Texas. The story cited the $60 million, 18,000 seat stadium built in Allen as another example of high school football run amok in Texas. Big and Bright-Chapter One Excerpt. … Launius lets his players know how to deal with the well meaning but sometimes distracting supporters in the stands. “Remember, you’re at La Marque. Best fans in the world, but they also know everything.” Defensive Coordinator Lawrence is very confident about tonight, telling his charges, “This defense, right now, is about where we were in the fifth or sixth week last year.” Coach Jackson expects the Tornadoes to come out flying, but thinks they’ll fade once the emotion settles down and as long as the Cougars don’t give them an excuse to think they’re in the game. Several coaches recommend I go to the pep rally after school, saying a La Marque pep rally is unlike anything I’ve ever seen. It turns out I have seen its like before. The suggestive, rhythmic dancing by girls in skimpy sequined costumes may not be the norm in Texas, but I’d seen many similar high school groups in New Orleans during Mardi Gras. The crescent of coastal Texas including Galveston, Houston and Beaumont has more in common with Tidewater Louisiana than other parts of its state. Texas is only one state, but it has more cultural regions than most countries. After the rally, Cougar players come in for their game uniforms, navy blue jerseys with gold numbers, COOGS stitched below the neck, matching pants with ‘CTS’ on the right hip and blue socks. The players head to the cafeteria for a team meal and a short devotional by Pastor Lee before getting on the air-conditioned school buses that carry them two miles to the stadium. Etheredge Stadium is impressive, but not because there’s anything noteworthy about its architecture or size. The place is simple and functional; just two slopes of steel bleachers, an adequate pressbox, Spartan locker rooms, a basic scoreboard and a natural turf field. What’s striking is the care taken preserving it. It must have been built 50 years ago, but the 11,000 seat stadium looks brand new. Like a perfectly restored 1970 Dodge Dart, nothing showy, but clear reverence for the traditions this place holds. The field is perfectly manicured and stenciled, the Cougar paw painted at midfield for the game, as the buses arrive from La Marque at 5:00. It’s a hot and muggy evening in Galveston County. The players, coaches and fans are already dripping sweat at kickoff. The stands are about half full. This is a rivalry game, but nobody expects much from G-Ball, and their fans don’t travel well. Not one to overlook any opponent, Jackson’s looked nervous all day. He’s a deeply superstitious man; on the sidelines he dresses all in black and has several game day rituals followed each week. A stick of gum is given to the same chosen assistant during warm-ups, he always finds his young daughter in the stands holding up a personalized sign of support. A few years ago he wore something that wasn’t black and his team lost. Since then, he’s careful to stick to his routines. When I first saw it, it was ranked at about a million and a half on Amazon, today it is in the 300,000s… don’t know what this means in actual sales, but I guess somebody is buying it. For any programs who would like to sell the books at games, below is the ordering information. I think you get a better price if making bulk orders directly from the publisher. I am working on setting up some promotion with my publicist. Hopefully I’ll have more information in the next few weeks. 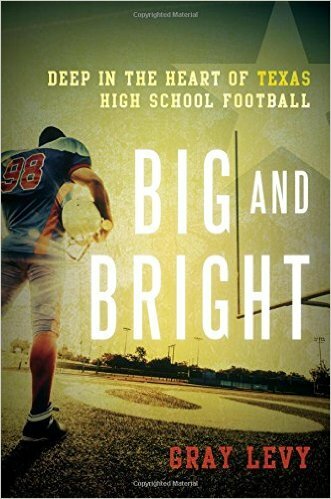 Big and Bright now available for pre-order!! The book itself comes out on September 2nd, but I was surprised to see it today on Amazon… I was even more surprised to see this cover, a cover that I’d never seen before. Whatever the cover looks like though, I’m excited that the book is finally about to come out… Go to the link below to order it now, or stay tuned for more information as I get it.